Not all honeys are born equal. Do you know which honeys have the highest antibacterial power? And which of these can kill MRSA – the super-bug that can harm us so badly and is so difficult to kill? It has become more and more difficult to eradicate powerful infections. The microbes mutate faster than conventional medicine can keep up with. This is why the possibility of using herbs, honeybee products and other natural products for the treatment of infection is again seriously considered. Honey, the sweet medicine, is composed of 80% sugars, mainly fructose and glucose, and minor amounts of oligosaccharides, but there are also other compounds, in combinations that makes them perfectly work in synergy: enzymes, peptides, free amino acids, vitamins, organic acids, flavonoids, phenolic acids and other phytochemicals and minerals. Honey is an easily digestible and high energetic food product. 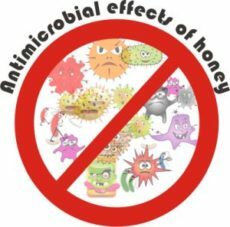 While all honeys have common factors that contribute to their antimicrobial power, some of them are more potent than others, some act against some bacteria ans some against others. A gram-positive bacteria, also called “a super-bug”, resistant to antibiotics. Staph skin infections start off as a small, red bump that resembles a spider bite — these infections can progress quickly, turning into swollen, painful abscesses, which doctors need to surgically drain. Staphylococcus is one of the five most common causes of infections after injury or surgery. It affects around 500,000 patients in American hospitals annually. It can be transmitted easily through air droplets or aerosol. It can also infect the bloodstream (causing sepsis), lungs (causing peumonia) or urinary truct (causing urinary tract infections). It is common among people with weak immune system, which live in hospitals, nursing homes or other health care centers, a condition known as hospital-acquired MRSA (HA-MRSA). But it can also be found in perfectly healthy persons, known as community-associated MRSA (CA-MRSA) found in team athletes, military recruits, in prisons or in kindergartens. Plenty of healthy people carry staph without being infected by it. One third of everybody has staph bacteria in their noses. These bacteria naturally live in the nose and on the skin and generally don’t cause any harm. A MRSA infection occurs when the bacteria manage to enter the body through a cut or a break in the skin. MRSA is a fast adapting bacteria and now it is resistant to all β-lactam antibiotics, methicillin, amoxicillin, penicillin, oxacillin, and many other common antibiotics. Currently the drugs of choice for treatment of MRSA infections are glycopeptides, mainly vancomycin. Unfortunately, staphylococci also develop resistance to this group of antibiotics, too, and the vancomycin-resistant S. aureus (VRSA) strains is constantly growing. Which is why the attention of the research is now focused on natural products such as honey, propolis and essential oils, as MRSA is sensitive to them and does not adapt. What kills MRSA? What is the best honey for this? Not all honeys act the same. There are honeys that do not possess any antimicrobial activity against certain bacteria. Here are the ones that do have powerful antibacterial activity against MRSA, according to studies. 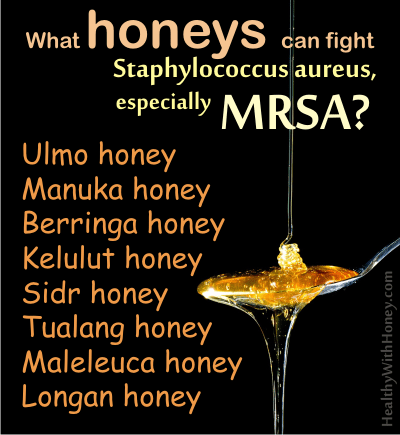 Remember that MSSA (antibiotic‐sensitive) and MRSA (antibiotic-resistant) strains showed similar sensitivity to honey. Ulmo honey from Chile Lab tests showed that Ulmo 90 honey had greater antibacterial activity against all MRSA isolates tested than manuka honey UMF25+ (Orla Sherlock et al., 2010). More on ulmo honey. Kelulut honey (made by Trigona carbonaria stingless bee) also has a high antibacterial power against S. aureus. Agar inhibition assay showed kelulut honey to possess high total antibacterial activity against S. aureus with 26.49 equivalent phenol concentrations (EPC) and non-peroxide activity of 25.74 EPC. (read more about kelulut honey). Manuka honey – Manuka Honey UMF +20 has a bactericidal effect on both methicillin resistant and sensitive S. aureus. There are lots of studies proving its high antibacterial power. (Jing Lu, 2014) More here. If you take this honey for internal problems, you can have it in a very hot tea! Don’t worry about the heat destroying the good qualities of honey. Manuka honey’s health benefits are not affected by heat. Berringa honey – aka the super manuka honey from Australia. With even a higher MGO concentration, this honey proved high antibacterial activity against MRSA (Sultanbawa Y et al., 2015). See Berringa honey article. Malaleuca (aka gelam) honey from Malaysia (Gelam honey was recorded as the most potent honey (among the Malaysian honeys) against S. aureus, in which a dilution of only 5% (w/v) was required to inhibit and kill them at 6.25% (w/v). (Mohd Izwan Zainol et al, 2013) What is gelam honey? Buckwheat honey (Finland) At a concentration of 60% buckwheat honey, the MRSA survival was 11%. Some promising results regarding antistaphylococcal activity of ethanolic extract of Polish propolis (EEPP) against methicillin-sensitive S. aureus (MSSA) and methicillin-resistant S. aureus (MRSA) clinical isolates have been recently revealed by Wojtyczka and coworkers. in 2013. In contrast to antibiotics, propolis is a mixture of many antimicrobial components, thus development of resistance against this product (parallel resistance to all active constituents) is not possible. Even more, the propolis extract may facilitate and augment the antibiotic action by correcting the pharmacokinetic and pharmaco-dynamic properties and thus potentiate its biological action. One of the best characterized essential oil, which effectively inhibits growth of S. aureus, including MRSA isolates, is tea tree oil (TTO) derived mainly from the Australian native plant Melaleuca alternifolia. The oil obtained from Lavandula angustifolia demonstrated in vitro activity against MRSA at concentration of <1% [R R Nelson, 1997]. It was demonstrated that oil from lavender of Bulgarian origin, which contains 51.1% linalool and 9.5% linalyl acetate as main components, was more effective against bacteria than oil originated from lavender sample of French origin containing 29.1% linalool and 43.2% linalyl acetate. It is believed, however, that lavender oil may be useful, first and foremost, as a prophylactic or topical application for surface infection (HMA Cavanagh, 2002). Recently research of many authors showed also the antimicrobial activity of geranium oil against MRSA (Silva NCC et al., 2010). Origanum vulgare oil is used against multiresistant bacteria, including MRSA, and was analysed by Costa et al. in in 2009. Both the oil and the cinnamaldehyde, which is the main chemical constituent of this oil, also showed activity against MRSA. Essential oil from Cinnamomum osmophloeum (clone B) had an excellent inhibitory effect with the MIC of the essential oil and cinnamaldehyde against MRSA from human stand at 250 μg/mL (Shang-TzenChang et al., 2001). What makes honey a good antimicrobial? Several factors work together (in synergy) and have this antimicrobial effect. The mechanism of action is highly complex and still remains not fully recognized. 2. low pH value — among 3.4 to 6.1 In combination with high osmotic pressure, this eliminates the development of most microorganisms; Low pH also means high concentration of organic acids (e.g., gluconic acid). 3. bee defensin-1, which is a peptide secreted by the honeybee hypopharyngeal glands. It’s an important component of royal jelly (it is also called royalysin), playing a key role in the health of bee larvae. It exhibits activity against Gram-positive bacteria, including Bacillus subtilis, Staphylococcus aureus and Paenibacillus larvae (etiological agent of important bee larval diseases American foulbrood). 4. glucose oxidase, an enzyme produced in honeybees’ salivary glands and introduced into the nectar with the purpose of protecting the ripening honey against the development of pathogenic microorganisms. In the presence of water, this enzyme turns glucose into gluconic acid (catalyzes the oxidation of glucose). Hydrogen peroxide (H2O2)is the side product of this reaction, which is a strong well-known antimicrobial agent. H2O2 was found to be successful in the treatment of skin and soft tissue infections, infected wounds or eradication pathogenic bacteria located within upper respiratory tract or Helicobacter pylori from the stomach. 5. methylglyoxal (MGO), a controversial substance, a potentially toxic metabolite that acts like any antimicrobial that kills or inhibits the growth of microorganisms. It is formed by conversion of dihydroxyacetone (DHA) present at exceptionally high concentrations in the nectar of L. scoparium flowers. MGO is found in considerable amount only in manuka and relative species. 6. other phytochemicals, especially phenolic compounds, are important antibacterial ingredients of honey. This would also explain the different antibacterial power of different types of honey. Yet, scientists say they are not crucial for the antimicrobial potential of most honeys. 7. Other non-identified substances. Scientists agreed about the presence of other antimicrobial components (combination of cationic and noncationic but not identified substances) other than methylglyoxal, glucose oxidase and defensin-1. In Manuka honey this was confirmed in the studies of Kwakman and coworkers (Paulus H. S. Kwakman, 2011). Read more about what gives honey its antibacterial properties. Honey is one of the major therapeutic agents of traditional medicine. I do not work with guest posts. This website is a personal travel into the world of honey. Sorry.